Finnair conducted a consumer research study during summer 2018 to find out what Finns think of the different ways to reduce or compensate emissions resulting from aviation. According to the study’s results, the majority of Finns are ready to pay to reduce the emissions caused by air travel, but want the proceeds from possible additional charges to go directly to environmental work. Responsible travel is thus increasingly important for Finnish travellers. Finnair is responding to this by introducing a new service in early 2019, which will offer customers an easy way to support measures that directly impact the carbon load. For example, customers will be able to pay to support the use of biofuels and carbon capture initiatives. Finnair is also continuing its own comprehensive measures to reduce its overall CO2 emissions. According to the study, almost all Finns (94 %) want to reduce the emissions of air travel, and many are also willing to pay for this as a part of the ticket price. The respondents saw supporting the use of biofuels (55%) and carbon captures (28%) as the best alternatives for reducing the environmental impacts of flying. For example, forests and other biomass capture CO2 from the atmosphere through photosynthesis, and thus act as significant carbon captures that can offset more CO2 than they produce. Only 11% of Finns, however, were in favour of a flight tax. When asked directly about a flight tax, 73% of respondents said a flight tax should not be introduced if the proceeds cannot be directly attributed to reducing environmental impacts. On the other hand, 76% of the respondents were ready to pay more for a flight ticket, or alternatively, pay an additional charge, if the money is used for reducing environmental impacts. There was a lot of dispersion in what would be an appropriate amount to pay, but the majority of respondents were ready to pay approximately five to 20 euros extra for a one-way flight within Europe. However, almost 20% of the respondents were ready to pay more than that. The study also showed that the international emissions trading mechanisms are not well known by Finns: over half of the respondents (60%) did not know aviation was a part of the EU emissions trading scheme and did not know of the upcoming global emissions scheme (CORSIA). The study was conducted for Finnair by Innolink Research and Spring Advisor during the summer of 2018, and approximately 1,200 Finns were interviewed. Finnair now invites its customers to join in on the work to make aviation more environmentally responsible. As of early 2019, customers can choose to support either the use of biofuels or carbon capture initiatives when they fly with Finnair. 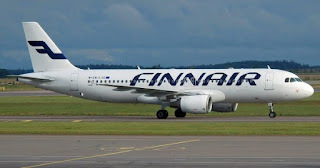 Finnair will offer two alternatives: customers can either purchase biofuel to be included and blended on a later flight, or support a carbon capture project with a sum of their choice. Already over half of Finnair’s long-haul fleet – 11 aircraft – is comprised of new, fuel-efficient Airbus A350 aircraft. Vauramo also stresses that every single passenger can impact the carbon dioxide load of their own trip with their travel choices.